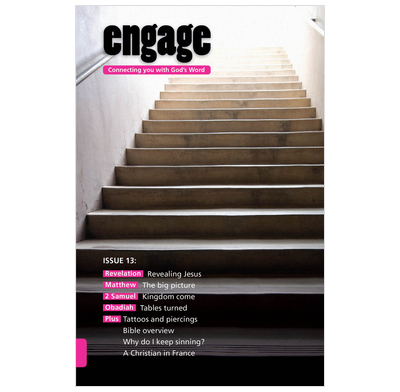 Issue 13 of Engage looks at Revelation, Matthew, 2 Samuel and Obadiah. Issue 13 of Engage - daily Bible reading notes for teenagers. This issue looks at Revelation, Matthew, 2 Samuel and Obadiah. • I can’t stop sinning! I have two girls aged 11 and 8 who have found the series not just inspiring but as well stimulating. We all look forward to our family devotion time together, it really engages, for us it is question time. Would definitely recommend for use to family with growing up kids, it is all worth it. As a Mum of 3 small children I don't get very long to read my bible in the morning. I have found these notes to be really great at helping me look at the passage and get something out of it rather than just forgetting what I have read in the tired blur of the morning. Not very long and easy to access. I have found these Bible studies useful to give away to our youth at church, to encourage them to read the Bible. I also consult these studies when we are planning our Youth Group Bible studies. Engage is readable, sensible, and useful for ministry. 5 stars. I used this as a teenager, and now recommending this to the youth group at my church. Each devotion can take 5-20 minutes and I like that there was no dates so no pressure. Perfect for teenagers to decide how much of time and effort to give. Find these bible study aids very helpful for my teenager. They involve thought about the passage and are in manageable daily portions. I was excited to find an undated bible reading resource that covered the whole of scripture - I have purchased this for a secondary school library so that they can be used by pupils aged 12-18 and the RE department are thrilled. The books are suitable for younger teens all the way through to adults and the first keen borrowers were school support staff. I have told friends about them and one said it was just what she had been searching for as a daily reading help for her 11 year old son. I use this with my teenage children. It's written in an engaging and relevant style and this is what I find useful. Also useful are the more open-ended questions. My teenage sister has found 'Engage' helpful and very suited to her age and situation.